For each day that passes the World Cup draws ever closer. adidas are going big today and releasing all their shirts for the tournament today. Get a look at the World Cup 2018 Argentina shirt here. A collective sigh of relief could be heard around the adidas offices, when all things fell perfectly into place for Argentina and they managed to qualify for the World Cup. For a very long time though it looked like Messi & co. weren’t going to make it, but with a little help from some shock results they pulled it off. And looking at this shirt, aren’t you just glad they did? It’s a beauty. Sensationally simple and with stunning details that honour the Argentinian football association's 125th anniversary. The way adidas pay homage to the AFA’s anniversary is by incorporating the laurel from country’s coat of arms into the famous stripes that run down the Argentina shirt. To keep the shirt modern the laurel design is pixelated, which also makes the shirt look super sharp. 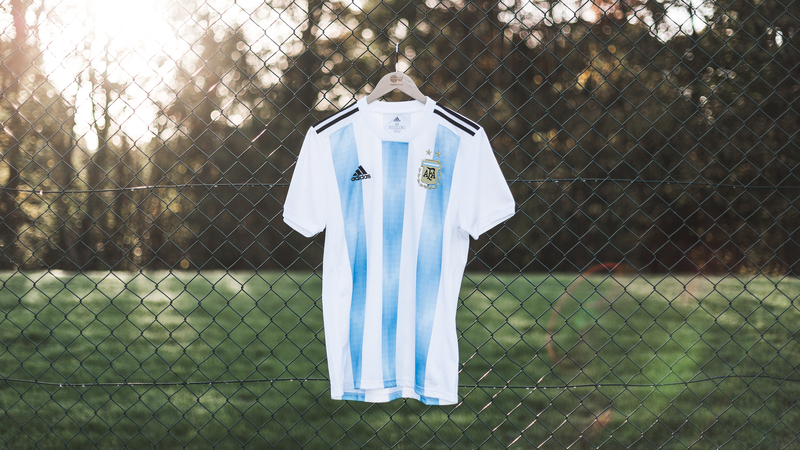 The World Cup 2018 Argentina shirt is available already today, so if you want to show your support for La Albiceleste. If qualification proved one thing about this Argentinian national team, then it is that you can never count them out. Even though they look weak, they could very well mount a challenge for the World Cup next summer in Russia and this could be the shirt you see hoisting the trophy on the 15th of July. There have been lots of other World Cup 2018 shirts launched today. Read more about Spain, Belgium, Germany by clicking the name..